David Ortiz had a big game last night. He was 2 for 3 with a home run and a walk. His efforts helped produce two runs as the Sox beat the Angels 3-1. But he didn’t stick around to talk about it. By the time reporters were allowed in the clubhouse, David had split. That’s not good for people in my business. 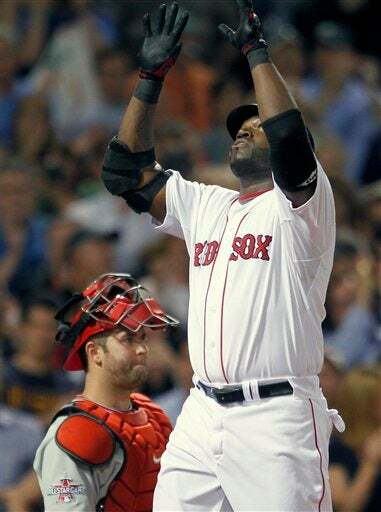 But it was probably a good move by Ortiz given all the chatter about whether he should be playing. In the end, all the talk, polls and opinions do not matter. Either Ortiz will hit or he will not and assessing every game like it’s a presidential election is silly. I’m as guilty as that as anybody else, by the way. Ortiz makes for good copy and people react. But ultimately, his performance has to speak for him and David knows that. This has gone beyond the point of his explaining himself every day. Everybody knows he’s trying hard and wants to do well. You may have missed this quote from Adrian Beltre, who summed up the night well. “It was good for him and for his confidence. He’s a guy under the microscope and he wants to do well, he wants to be here and he wants to help our team. When he doesn’t perform the way he knows he can, it’s tough. Those days wear you out. But a day like this, when he hits a couple of balls to the opposite field and hits a homer, it’s good for him. “We all know that he can hit. There’s a funk in his head right now and too much stuff going on. But if you let him play, he’s going to get you numbers because he’s been doing it for a long time here. It’s tough to watch, especially a guy like that because everybody loves him. He’s such a nice guy. He’s going through stuff that’s not easy for anybody. The Angels are starting a lefty tonight. Mike Lowell, you’re up.